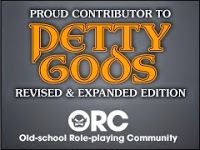 Unless I'm GMing a one-off or a tournament/convention game (which are usually one-offs...) I like to have some decent level of continuity and campaign mastery for my players, but I don't want to rail-road them or waste my limited prep time on information I'll (likely) never use. Many game sessions are just continuations of a well-defined path (i.e. the party is already in the dungeon where we just stopped the session's action for the night) and I don't have to do much additional prep work, but other times I don't have a firm grasp on where I expect the players to go. Sure they might bite on the hook I set for them, but they may also decide they don't want to go "fishing". For me I just use a long list of pre-generated names (from various races) created by Tablesmith. When I use the name, I circle it and make a note where the NPC is. If I can I write two-to-three adjectives describing the NPC which helps me out later. I prefer to do my towns and cities ahead of time, but I'll keep a small(ish) pre-gen town handy just in case the group goes into a city I wasn't expecting. I figure that by using a smaller town I can always just treat it as a portion of a larger city if I need to. What I do is use the City Generator to tell me about my city and then use those parameters with the Roleplaying City Map Generator to get a map. The players don't see the map so I can mark it up all I want and fix things later. I also like to have a couple bars or inns on standby as well. I use Tavernmaker for this and it works well for most of the info I need. This program doesn't really give me the menus or beer-list I want (most of my players like their beer so I try to have unique beers for their PCs). I tend to either use Tablesmith again, but lately I've been having fun with the Random Menu Generator from Inkwell Ideas. Now I usually have a couple of small dungeons prepped that I can make up a story for introducing based on how the PCs are interacting with the NPCs. I don't have a steady source for these as I collect them from all over. In a pinch I'd start with some basic maps from the likes of +matt jackson or +Dyson Logos . If you need to, devote a couple pages to appropriately statted-out monsters, traps, and treasures. 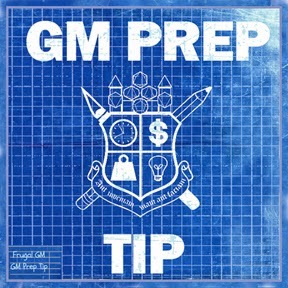 Now you'll have to determine what you'd want in your "Book", but the real GM Prep Tip is to have the book to begin with. Front-loading information that would prove useful to you in your game offers a relatively good return on your prep-time investment. With all of the "hard" information already prepped, you can quickly and effectively "wing it" using the "soft" information provided to you by your players at the table. Your game will feel much more organic, your players will have fun, and you won't have to stress about the game at hand if it goes off-rails*. *Because it will, it's what player do!